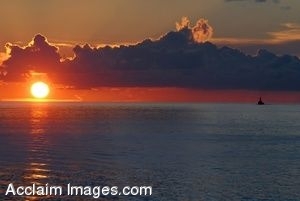 Description: Clip art photograph of a military aircraft carrier in the pacific ocean at sunset. The Ticonderoga-class guided-missile cruiser USS Chancellorsville (CG 62) stands by as plane guard for the Nimitz-class aircraft carrier USS Ronald Reagan (CVN 76) as the sun sets over the horizon. The Ronald Reagan Carrier Strike Group is on a scheduled deployment in the U.S. 7th Fleet area of responsibility operating in the western Pacific and Indian oceans. (U.S. Navy photo by Mass Communication Specialist 3rd Class Joshua Scott). Clipart photograph by Department of Defense Public Domain.